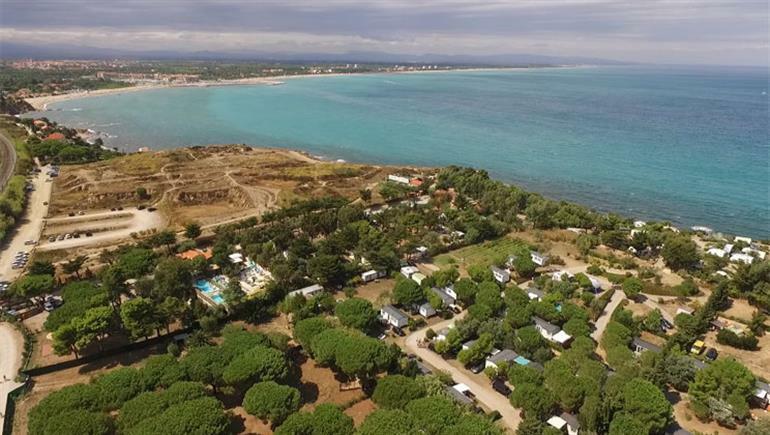 Want to have a closer look at Criques de Porteils campsite? If you think Criques de Porteils campsite in Collioure, Languedoc & Roussillon is the holiday park you, why not have a closer look, and check out prices and availability. Criques de Porteils campsite family holiday park has 248 pitches. Eurocamp have family holidays parks all around Europe. Criques de Porteils campsite (WM064) is just one of the family holiday parks in Collioure, Languedoc & Roussillon, France. Have a look for other holiday parks in France. You can also see what other people though with the reviews of Criques de Porteils campsite. These are the reviews for Criques de Porteils campsite. There are 98 reviews. Nearby train line noisey. Mattress very uncomfortable. Very happy to have spent a week at this peaceful parc. our accomadation was fine but as an older, obese and not as fit as we could be couple we found a week in the smaller confines than we're used to tiring. . collioure and the surrounds are lovely. I loved the scenery and proximity to mediterranien. We will come back. our plan is to be fitter and a little thinner next time! A lovely parc and lots to see and do.well stocked shop in site. Good position,clean accomodation, friendly couriers. Had a great time. Brilliant! we loved it at criques de porteils and would definitely go back. We wanted a sunny relaxing break away with plenty of things to see and do, the holiday lived up to these expectations. Having never visited this region of france we particularly liked collioure and the coastal area. A trip into spain to see the salvador dali museum was also a great bonus. Lovely parc - quiet, stunning views, easy walking access to great beaches and to collioure, plus lovely coves below the parc. Perfect small parc situated right by the med. Beautifully maintained by the parc employees, who were very helpful, kind and took a huge pride in their job . euro camp couriers were delightful and most informative , even letting us know about the calais ferry issues. Possibly there could be more 2 bedroom or even 1 bedroom mobile homes for clients. The 3 bedrooms are rather too large and expensive for 2 people . overall a lovely holiday. Incidentally- there are cafetière sin the mobile homes! We have been travelling with eurocamp for over 26 years and have always had a wonderful time. Park has a beautiful situation. Slightly disappointed with the restaurant and the fact that the bar closes very early but otherwise difficult to fault. Would not suit anyone expecting lively entertainment. The couriers were probably the best we've ever come across on a eurocamp holiday. We thoroughly enjoyed collioure which is a very special place. We had a great holiday. The park was great and the accommodation was excellent. The couriers, martin and maureen were very friendly and attended to our every need. Great holiday, our couriers maureen and martin were the perfect hosts. Mobile home spotless. Would definitely go again. An excellent holiday. the camp site was everything we expected as it was our second visit. our accommodation was in a superb position and the couriers could not do enough for us .they were so friendly and very competent and helpful. We were expecting a sea view but understand that tents at the top of the site had been blown away. we did appreciate the quieter shady pitch but it was on a slope and was muddy. Excellent holiday, fabulous parc,wonderful area coupled with two brilliant couriers.all in all a holiday to remember.nhh. The best park we have stayed at, we have just returned from spending five weeks here and could have stayed longer. The pool is great with lovely cushions for the loungers, also some shade available as some of the trees have been left. The shop sells most things including fresh bread and milk. The restaurant has a very varied menu and the food and service was excellent. An older lone traveller so no comment on site facilities. Very helpful site staff, also couriers martin and maureen very friendly and helpful. Small site well placed for site seeing the terrific surrounding area and the fabulous spanish coves and beaches nearby. Also 3 significant salvador dali sites to visit, if you're a fan like me. Area is always windy sometimes gusting which is annoying. Nice area and pitch. The couriers were excellent and the weather was first rate. The local village was within walking distance and it was possible to walk to secluded beaches and coves whilst spain was just a short drive away. The only problem we had was that the pine trees were producing masses of pollen and the car and chairs were yellow and needed cleaning regularly! Wonderful campsite by the sea. Great hosting from martyn and maureen, perfect 1st holiday with our 1 year old son. very clean and good facilities, lovely area. Great park with friendly staff (both park and eurocamp staff) good location for exploring local area with lots to do for all ages. Pools were lovely and clean and bar was fantastic and very welcoming. . we also had great weather which made our stay in the tent a pleasure. I must add that the view from the cliff top location of the tents is magnificent. Unforgettable holiday in great surroundings. Perfect. Lovely quiet park well situated. Couriers very friendly and helpful. Would definitely return. Quite simply the most amazing holiday for a family ..ever - we're already planning another eurocamp holiday and would definitely return to criques de porteils again! it's a 5* campsite and it was a 5* experience! A lovely parc, small but with all the amenities you might need. Lovely site,clean and tidy. Perfect location,lovely restaurant, reception staff very friendly and knowledgeable. Lovely area and park. be good if pool was warmer and maybe better access to bike hire facilities. Really enjoyed our week. We had a relaxing time ; it was only the wind that was challenging, and that the most of the local area was 'closed' - it was difficult to find a cafe open in any of the surrounding towns or villages other than collioure, which was lovely. I would go back though - conveniently close to the airport, easy driving and good proximity to collioure. When the wind dropped it was very relaxing and the camp facilities were good. all staff were very helpful and friendly. Fantastic location, very relaxed campsite, fabulous restaurant on the site. The euro camp couriers were not only friendly, and lovely genuine people but they were more than helpful on every occasion. Overall a great holiday on an excellent site with superb accommodation and caring courier. Site in superb setting on coast but easily accessed by road, and only a short walk into collioure. facilities on site a bit limited, small swimming pools & restaurant/ coffee bar basic, and some way from reception & pool area. Overall we really enjoyed the site & the area. Loved the location of the site. Private beaches & near local resorts. We really enjoyed our holiday, although would have liked there to have been more of a choice in restaurant and even a coffee shop. There could also have done with being a bigger bettwr stocked grocery shop with cheaper prices, as the prices were very high. Good holiday marred a little by illness. Lovely parc in a lovely coastal setting. Good compact site with lots of activities, nice sized pool and a small rocky beach. Very relaxing environment with friendly staff. . . proximity to collioure was handy. Weather was poor - strong northly winds. Parc in a nice position although some pitches or homes in cramped positions. Restaurant poor and pools far too small for size of parc. Private coves make up for everything else. A lovely parc with great views over the med on one side and the pyrenees on the other, within easy walking distance of of the intensely interesting historic port of collioure. This camp site is not for us. wifi lousy, no water on the pitches which is very poor given the cost, dreadful parking, dangerous path to the toilets which is pitch black at night, everything filthy due to the constant dust, which included the contents of the cupboard! my iphone bloke down due to the constant fine dust blowing around getting into the inside of it. We had a very enjoyable stay, the campsite location near to collioure and argeles was good. We too had an tent pitch with wonderful views. A couple of things, however, could be improved on the campsite i) whilst campsite was near to capacity not all toilet/shower blocks were open; this fact put extra pressure on the facilities that were open i.e toilets were not always clean. The swimming pool is small for the size of the campsite. Wonderful setting between med and pyranees. Weather brilliant, area great, will return. More knowledge of local festivals would be good. E.g fete de la musique, fete de st jean du feu. We had a lovely holiday in a beautiful setting. It would have been nice to have had a view of the sea from the mobile home but otherwise we were well satisfied. The courier was absolutely fantastic. We had an enjoyable week at this parc as part of a month away in france." An excellent holiday in pleasant surroundings. This camp site is excellent. Hazel , the courier was always helpful and pleasant. Wonderful campsite. Hazell lovely and so helpful and friendly.enjoyed a glass of wine with her one evening. I would definitely go again and just hope it was less windy! my little dog loved the walks. Scenery spectacular. We had a wonderful time here. This was no doubt partly due to the glorious weather, but the parc was lovely and the area is probably one of the most fascinating in france. . it was great to be able to walk to le racou and collioures, and the views from the coastal path were incredible. Out of season, collioures was charming, with a selection of delightful restaurants and bars for whiling away the day, as well as a fascinating chateau. Perpignan is a vibrant city, well worth a visit and the ruins of the castles at queribos and peyrepteuse, set in the foothills of the pyrenees were breathtaking, well worth the tortuous climbs!. the parc is small, but beautifully kept. Our three boys loved the sports area and we all spent hours in and around the pools. Our dog was in heaven, with daily walks along the cliffs and a cool shady deck to lie on. The local vet in argeles-sur mer was helpful too for his return check. Fabulous holiday- we will be back soon. A lovely parc in a beautiful setting, well equipped for a good holiday. Great parc in a great area, just a shame that the private beach has been washed away! The crique de porteils site was very good in itself and the courier was good. However, the whole area was very windy and prevented us from sitting on the beach or around the pool. Although I would recommend the site, I would advise people against going to this particular area. The second part of our holiday was at the domaine de masserau in sommiere - a site where we had been two years previously. Again the park was good. However, we encountered the worst courier (he introduced himself as bob) we have ever had the misfortune to be acquainted with. The chalet was extremely dirty. My wife had to get on her hands and knees and scrub the floor because it felt so gritty. Afterwards the water in the mop bucket was black and the floor was showing signs of the original colour rather than the dark brown at first glance. The bathroom sink was taking ten minutes to drain. It turned out that it was a faulty plug which we managed to fix but it was obvious that the courier had not even turned on the tap let alone sanitise the chalet. One day we observed him "cleaning and sanitising" a chalet on a changeover day. He entered the chalet, looked in the fridge/freezer (presumably to see if there were any "goodies" left), walked into the chalet, returned to the fridge/freezer and looked inside again, and then came out onto the verandah. In all less than one minute. He stood on the verandah for about 20 seconds for whatever reason (did not acknowledge us who were opposite) and then left. If that is the sum total of his handover task, then it is not surprising that the chalet was in the state it was on our arrival. Later conversations with other eurocamp clients told similar stories. We saw him around the site and at the restaurant. Whilst other couriers have always acknowledged customers, he totally ignored us. Whilst one doesn't expect couriers to remember every client, it is common practise at camp sites to say hello to other people, even other nationalities and those who are not eurocamp clients. A holiday totally spoiled by the second site. We did get price lists of the chalets owned by the camp site and if we return to domaine de masserau, we will seriously consider going privately! I expect this review to be brought to the attention of the customer services director. Excellent site, caravan accomodation and courier. thank you. While the pitches on the coast/cliff side of the site are very nice the eurocamp pitches are not on the coast side! the sncf train rattles by regularly and in the early morn, the pitches are very cramped but functional for a mobile home, not like other french sites to which we have been. Enjoyed a relaxing time on a site which is well placed for getting out to lots of interesting places. Very good, only criticism is the checking in . procedure at les pins parasol taking far too. Long. Good. Nice camp (but see below). nice area, excellent scenery. Weather fantastic, but sea rougher than expected for the mediterranean. We stayed on several sites. I'm commenting mainly on criques but i'm not sure whether you just mean this site or the overall holiday on 4 sites. Lovely site on headland next to mediterranean. Enjoyed a week of very sunny weather going out and about in the region. A lovely stay in a lovely part of france. Beautiful place and lovely, well-maintained site with great swimming pool. The best campsite we have visited in france due to its proximity to the coast, busy but quiet nature & excellent facilities for all. The proximity of the pyrenees enabled us to enjoy the mountain beauty around the area. Lovely site, good accommodation. Great holiday in spite of rather than because of courier, see below. It is a beautiful area and the campsite was a good place to explore from. the courier was friendly and the accommodation was good. At 67 & 65 we realise we are too old for this type of holiday . we used you for 11 years when the kids were young which all of us enjoyed . When we first arrived I was all for switching to another site as I was so disappointed; in the end i'm glad we stayed because of the site's location midway between collioure and le racou, and walking distance to each. We enjoyed several meals in collioure and no worries about driving back :). I don't think I will use eurocamp again in school holidays because it's just too expensive, though might consider returning out of season. A shame, as i've been a loyal eurocamp customer for many years. Lovely quiet parc with the most wonderful views! Relaxing holiday in a beautiful location. An excellent part of the holiday. An excellent campsite and plenty of places to visit. Pleasant camp in nice setting, within walking distance of resorts. Accommodation in static vans was comfortable & well appointed, eg good kitchen. Eurocamp rep (chas) always around,very pleasant and helpful.campsite ok with nice pools, shop well stocked, restaurant was passable . overall really enjoyed being there. Lovely site ,well managed ,clean and well laid out ,beautiful area . We were lucky to have a superb location overlooking the sea. Overall the weather was hot with only 2 days of rain.a good location for many interesting sites but travelling time including local paths is generally under estimated. A great holiday and we would certainly go there again. This is an excellent site. It has lovely views of vineyards, is peaceful, relaxing and very clean. The pool is pleasntly heated. if you enjoy walking you can walk into collioure (very picturesque) and argeles. Both have good restaurants and little bars and shops. There is a good restaurant on site ( we can recommend the moules). the jewel in the crown here is the eurocamp courier. Nothing was too much trouble for him and he really works hard to help you enjoy your holiday giving good advice and information. Even a daily weather forcast. It was a very good and much needed holiday. An extremely lovely park. Ideal for young families. We had a great holiday at criques de porteils. The site is very well placed for exploring the area and the facilities on site were very good.